Almaty International Airport is the largest international airport in Kazakhstan. It is about 15 km (9.3 mi) northeast of Almaty. 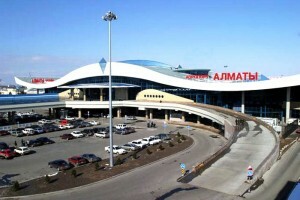 Almaty airport accounts for half of passenger traffic and 68% of cargo traffic to Kazakhstan. In 2012, the airport handled 4,003,004 passengers, including 1,997,570 arriving passengers, and 2,005,434 departing passengers. A typical car ride to the airport from Almaty takes between 30 mins and 50 minutes (depending on traffic). Practically every part of the country can be reached by air from Almaty. During the day you can take bus #92, #79. #106 and #86 to the city center, otherwise official taxis are available from the airport. Below are the airlines that fly to Almaty and where they fly from.